Research & Education Association, 9780738609317, 281pp. Are you crunched for time? Have you started studying for your Advanced Placement(R) Environmental Science exam yet? How will you memorize everything you need to know before the test? Do you wish there was a fast and easy way to study for the exam AND boost your score? 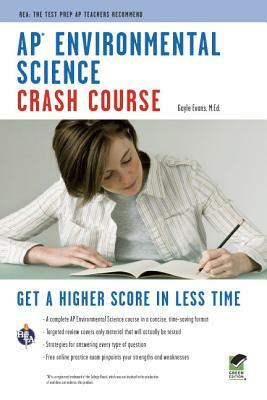 The Crash Course is based on an in-depth analysis of the AP(R) Environmental Science course description outline and actual AP(R) test questions. It covers only the information tested on the exam, so you can make the most of your valuable study time. Our easy-to-read format gives you a crash course in human population dynamics, managing public lands, energy conservation, changes in Earth's climate, species extinction, loss of biodiversity, and more. The author also includes must-know key terms and basic math and science concepts all AP(R) students should know before test day. Whether you're cramming for the test at the last minute, looking for extra review, or want to study on your own in preparation for the exams - this is the study guide every AP(R) Environmental Science student must have. Gayle Evans has a reputation among her students for her enthusiasm and passion for teaching about the environment. In the course of her career at Gainesville High School, in Gainesville, Florida, she has taught nearly every science course possible including AP(R) Environmental Science, AP(R) Biology, as well as Anatomy & Physiology and Physical Science. Gayle Evans has a reputation among her students for her enthusiasm and passion for teaching about the environment. In the course of her career at Gainesville High School, in Gainesville, Florida, she has taught nearly every science course possible including AP(R) Environmental Science, AP(R) Biology, as well as Anatomy & Physiology and Physical Science. Ms. Evans earned her B.A. in Biology from Mount Holyoke College in Massachusetts and her M.Ed. in Secondary Science Education from the University of Florida in Gainesville, Florida. She is also National Board Certified in Biological Sciences.